W.TEC: The Women’s Technology Empowerment Centre (W.TEC) was founded in 2008 and, as its name would suggest, focuses on female empowerment through technology. They work both with schoolgirls to get them interested in technology and to help them view it as a viable career option, as well as training older women in how to use tech. In addition, they run annual tech skills camps (endorsed by the Ministry of Education) for 11-17 year olds and are beginning to teach programming skills. They’re planning to run 3 camps this year with 30 students in each. Follow The Money: Based in Abuja, Follow The Money is a small organisation that has been running for two years. Focusing on individual communities in northern Nigeria, their motto is to Act Local, Think Global. Their most notable campaign to date took place in the town of Bagega, where lead poisoning had been affecting the people of the town and government funds allocated for cleaning up the area had not reached the community. For two years, they collected data in the field to show what was really happening including testimonies, photos, videos and medical reports. Following this, they launched a campaign on Twitter, Facebook and in mainstream media (radio, TV, newspaper). Within 48 hours, 850 million Naira (around £3.5 million) destined for the clean up had been released by three separate ministries. The campaign included a Facebook campaign in conjunction with Human Rights Watch, which encouraged people to write on the President’s wall. Save the Children, UNICEF and other NGOs and CSOs were invited to join and back the campaign. In addition, volunteers, activists and celebrities all participated. It’s a great example of how small, dedicated organisations can bring about change and action at the very highest levels of government and will hopefully inspire others to act similarly. Ipas: The Nigerian chapter of this international NGO focusing on increasing women’s access to safe and reliable reproductive healthcare. In Nigeria, they have established toll-free helplines, mapped all approved reproductive health centres and work directly with universities in the country. Paradigm Initiative Nigeria: PIN’s major concerns are youth unemployment and cybercrime. In 2007, they conducted a baseline survey in Ajuegunle (a deprived neighbourhood of Lagos) and found that the community there were the least likely to have access to government services or NGO programmes. PIN, therefore, decided to create free training courses and did not require users to have any specific qualifications. The trick for PIN has been to find relevant skills for young people to learn. One of the most popular courses they run is in ICT for small businesses. Students on the course are required to contribute 10% of their earnings for the duration of the course to PIN to help continue the services and must also commit to training five other young people in ICT skills. In addition to training courses, they have formed partnerships with institutions to take on some of the best trainees. The ICT skills for small businesses course lasts two months, after which time students are expected to have created a business plan. The training courses they run tend to start off with the basics of using MS Office products, before moving on to more complex issues such as web design. They have also worked on mapping projects in their local community and web training with Google. 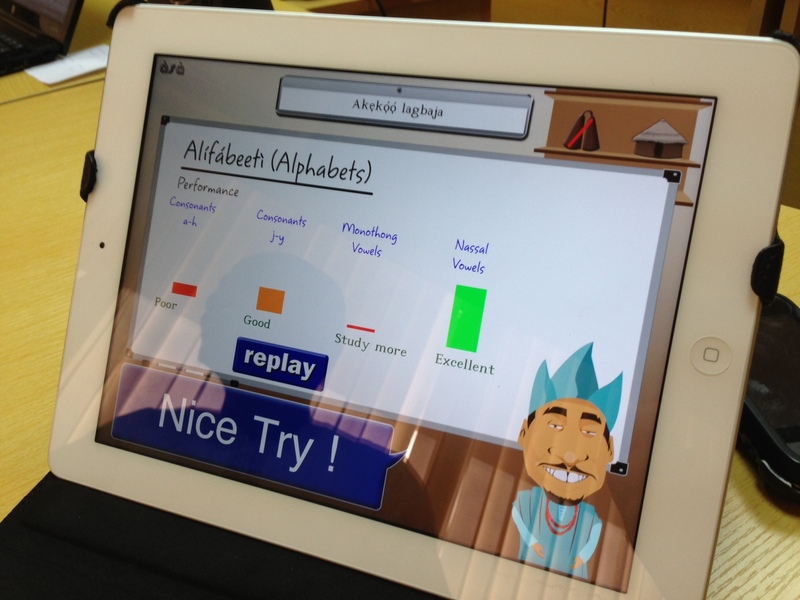 Efiko: Based at the CoCreation Hub, Efiko is a mobile platform designed to enhance learning through self-assessment. Tied to the National Senior Secondary School Curriculum and with content from reputable Nigerian publishers, Efiko presents learning with fun, social quizzes. A simple idea, but quite addictive (and a lot tougher than I’d anticipated). Judging by the scores I got on a couple of the quizzes, I won’t be passing my Nigerian school exams anytime soon. Naija Teenz: Like Efiko, Naija Teen is based at the CoCreation Hub. This website aims to make Nigerians think differently about themselves. The aim is to empower young people through success stories about people like them, while providing education on different aspects of politics, citizenship and careers. Youth for Technology Foundation: An Indigo grantee, Youth for Tech use IT to mentor young people and adults. They work across a range of issues, although the project we funded was to help young people become peer educators on issues of sexual and reproductive health. You can read more about that project here. If you know of other organisations working in the fields of education, health or youth empowerment that are using mobile and web technologies as part of their work, we’d love to hear from you. Please leave a comment below.